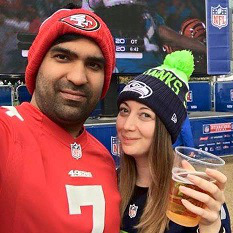 It does bring a smile to my face when I read about NFL fans in the UK who lament the fact they now have six months without football. I assume free agency and the draft holds little interest for them and I can’t believe they ignore Britball. The University league is approaching its climax and I was fortunate to be at the Southampton game Sunday when both teams put on a glorious display of football that was an outstanding advertisement for football in the UK and why NFL fans should make the effort to watch the games. On a bitterly cold winters’ afternoon, an unbeaten Southampton Stags hosting the winless Bournemouth Bobcats, did not initially give the impression of an exciting football game. For those that braved the wintery conditions, they were rewarded with a thrilling game that entertained to the last minute. The Stags powerful ground game against the refreshing aerial assault by the Bobcats was on display and it was Bournemouth who struck on their second possession when Matthew Barber-Street hauled in a 44-yard touchdown pass. The point after attempt hit the left upright, but against the odds Bournemouth were in front. In the breezy conditions Southampton missed a field goal, but on their next possession used their running game to great effect moving the chains before a quarterback sneak from Alastair Shaw put their first points on the board. Together with a good extra point, Southampton took a 7-6 lead. The defenses dominated the rest of the half during which Southampton missed another field goal attempt. On the first play from scrimmage in the second half, Stags’ Ademola Labis surged down the left sideline for a 55-yard touchdown extending their advantage although the two-point after attempt came up short. Bournemouth hit back on their next series with a superb completion that gave them a first down on the one-yard line. Instead of the expected run, a pass into coverage was caught by a leaping Jean Alex Geas. With a successful point after attempt, the game was all square at 13-13. 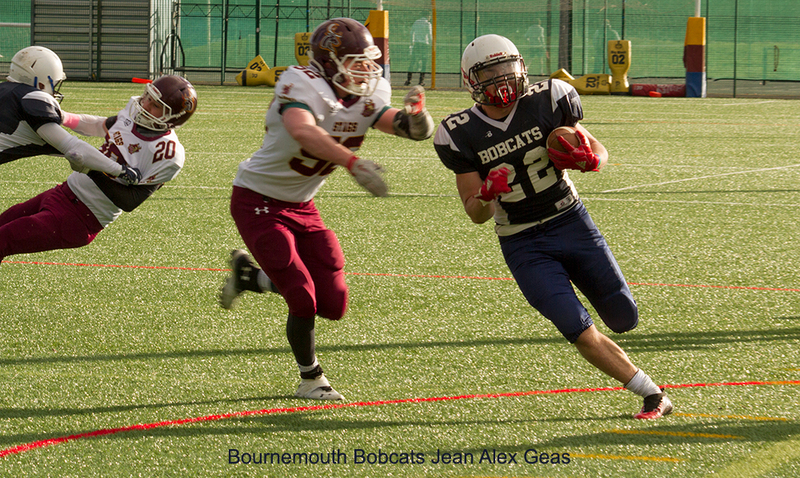 A fumble recovery by Bournemouth saw the Bobcats go into the final period on offense and it was the blue #22 shirt of “TiTi” Geas that began to advance the Bobcats on the ground and eventually his run into the end zone put Bournemouth back in front. Not to be left out, the white #22 shirt of Labis for the Stags began their next possession and the drive finished with an 18-yard touchdown run from Aaron Adekoya to tie the game 20-20 with a good extra point. As the game went through its final phase, defenses dominated and the teams exchanged possessions before Southampton turned to their battering ram Labis and aided by excellent blocking from his offensive linemen gained the yards and finally with thirty seconds remaining, ran in for the final score to take a 27-20 victory. The Southampton Stags remain unbeaten while both teams put on a splendid performance that was a very good advertisement for Britball if only the fans would only turn out and support it. I enjoy watching the Cardiff University Cobras but unfortuntately their season ended early this year as their play-off round was cancelled due to the bad weather. Totally agree people should make the effort to get out and watch Britball. Thank you for making the time to comment. The sport in the UK is improving and deserves our support.